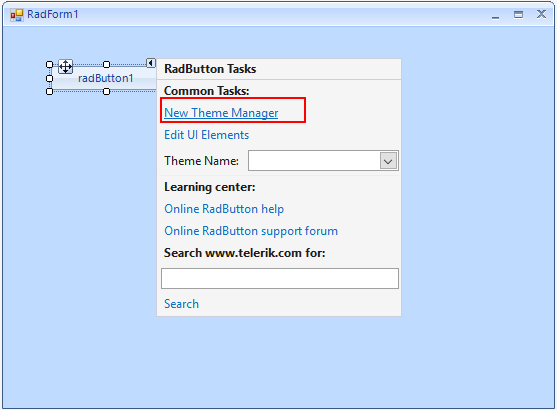 RadThemeManager is an non-visual component that manages the connection between themes (stored in XML files) and Telerik UI for WinForms controls on your form. To apply a theme to a control, the form containing the control must also contain a RadThemeManager. From the Smart Tag menu of any Telerik RadControl. From the Telerik UI for WinForms tab of the toolbox, drag a RadThemeManager component and drop it anywhere on your form. 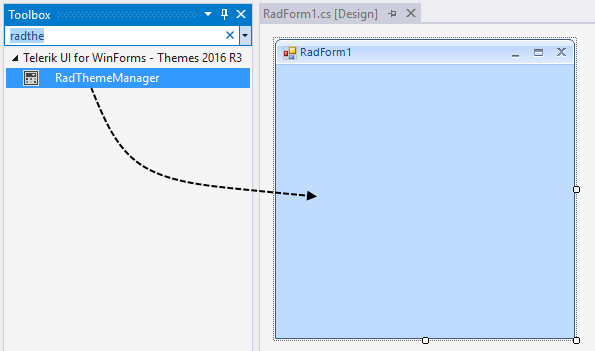 This action will create a RadThemeManager control in the form component tray area. Select any RadControl on your form. Open the Smart Tag menu, and then click New Theme Manager.